Florist's new single, "What I Wanted to Hold," sounds like the perfect song to wake up to on a Sunday morning. If you were to listen to it shortly after getting out of bed, while you stare out the window as you make your morning cup of coffee, you'll likely be relaxed into a memory-induced daze from the first gently-strummed chord to the last. In fact, it's so relaxing to listen to that it almost sounds like it was recorded specifically for that purpose. If this is your first time listening to the Brooklyn-based indie pop band, be thankful, because it's hard to imagine a more pleasant sounding introduction. The instrumentation on this track is simple and easy on the ears, and there are faint touches of cerebral-sounding synths in the background. The vocals are soft but passionate, and the poetic lyrics reminisce about former homes and loved ones ("Yellow light on the wall/I can close my eyes and return/to the home I remember in a blur"). Altogether, the band achieves an incredibly dreamy effect. It's like getting lost in a daydream about your childhood: sentimental, and full of longing. Fans who first fell in love with Florist after listening to their debut, The Birds Outside Sang, will surely not be surprised in the slightest by what they hear from "What I Wanted to Hold," and that's a very good thing. That whole album was bathed in glittery, atmospheric tones from beginning to end. "What I Wanted to Hold" is equally dreamy, and sounds like a direct continuation from everything that worked so well on The Birds. 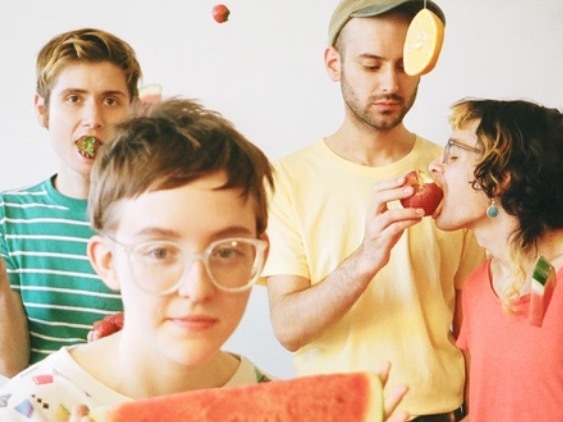 The song comes from Florist's upcoming sophomore album, If Blue Could Be Happiness, which is due out on September 29th. If "What I Wanted to Hold" is any indication, on this new album the band will be continuing to do what they did best with their debut last year.